On a hilltop lot with a view of the city, developer Ryan O’Connor decided to build a luxury duplex. “I wanted to do something special,” he says of his foray into the Calgary housing market. “I wanted a stunning building with the best high-tech architectural features.” Like many with ambitions to create great buildings, O’Connor was focused on both design and technology. For example, a snow melt system is under the walkways and patio. It ensures safety and low maintenance. At the same time, radiant in-floor heating provides continuous warmth and comfort over three floors. Light is particularly special. There is a skylight, an open tread stairway, and unique glass walls and flooring. There is even a back wall opening up to a rear patio which boasts a high-tech industrial barbecue. So, when it came to discussing the best building materials, Ryan O’Connor went high end as well. He consulted his builder, Phillip Rusch, and architect, Jeremy Sturgess, of Sturgess Architecture. Both professionals suggested combining the Advantage ICF System® with Insulspan® Structural Insulated Panels (SIPs). The combination gives homes the high-quality building envelope that purchasers seek out for durability, sustainability and energy efficiency. 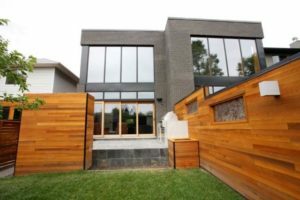 The Advantage ICF system was used for the basement and the dividing wall between the two homes. This means superior energy efficiency, as well as guaranteed noise reduction, and a three-hour fire rating. Then, the Insulspan SIP system was used for the exterior walls of the home. The SIP panels were custom cut and a technical experts from Insulspan provided expertise in the planning and installation stages of the project. 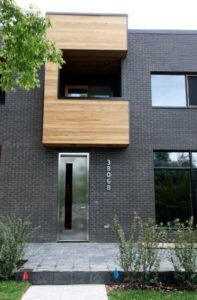 The Calgary Park Hill duplex’s energy efficiency matches the stunning architectural detailing. Learn more about building duplexes with Insulspan SIPs.